Announced in July, the HTC Desire 626 positions itself as an affordable take on the premium smartphone experience. Namely, it delivers a lot of the One M9 flagship and custom HTC stuff in a less expensive, plastic-clad model. In short, it’s a phone for those who don’t want to spend a lot of money or who don’t need a ton of smartphone. The Desire 626 is available in a variety of color options including Marshmallow White, Gray Lava, Blue Lagoon, Marine White and White Birch. The colors and general build are a complement to the heavier, metal stuff you’ll find in the One series. If you’ve paid close attention to HTC’s smartphone designs over the last year or so you’ll note that the Desire 626 closely resembles the Desire Eye and Desire 610. Perhaps it’s not coincidence that those models are offered by AT&T. For some reason, Ma Bell likes to offer this sort of smartphone to its customers. Using a polycarbonate material for much of the phone, the Desire 626 comes with flat (matte) colors for the front and back with a colored band/trim accent around the middle. As you might expect from AT&T, their version is the white and blue (Marine White and Navy) combination. The overall feeling with this one is that it’s not flashy or gaudy, but it certainly doesn’t feel cheaply made. It’s a soft phone to hold and there is enough curve to the shoulders and that it doesn’t feel squarish or rectangular. It looks every bit the part of what you’d expect out of HTC in 2015, including the front-facing speakers, screen trim, and logo placement. The first thing I thought upon taking this out of the box was, “wow, this is a tall phone”. It felt great in hand, though, and was comfortable to hold. After comparing to other models such as the One M9 and Samsung Galaxy S6, I found it was barely any taller or longer than most of today’s phones. Maybe it was a simple trick of the eye, but on its own, it appeared long. 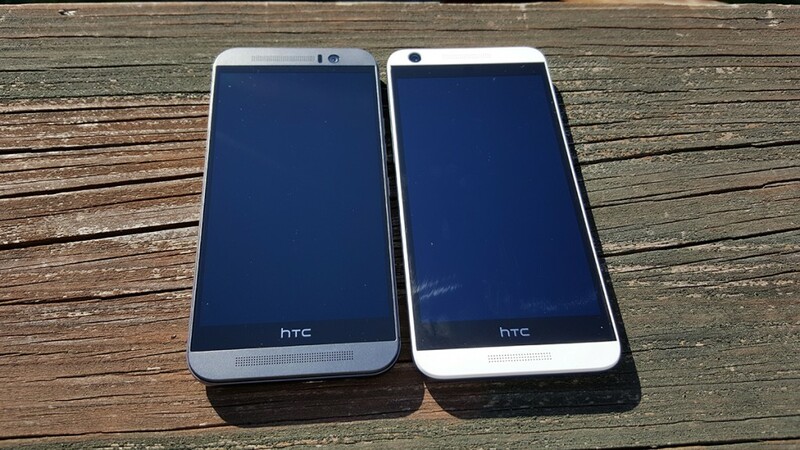 The HTC One M9 and the HTC Desire 626 closely resemble each other. 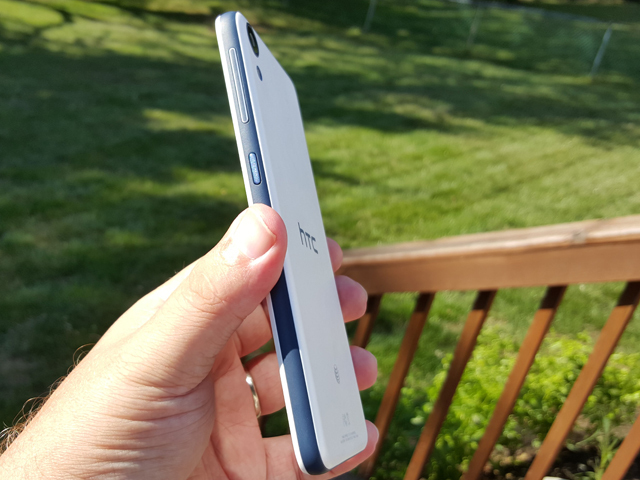 The Desire 626 is slim and fits in pockets quite nicely. It weighs just about what you would expect and is more of a pleasure to operate with one hand than its flagship. As a whole, the phone is solidly built; there’s no creaking or noises when I tried to bend and ply it with moderate force. Looking at the display, you’ll find the power and volume buttons to the right side of the phone. Both are found inside of the blue trim with the power placed below the volume controls. My hand is not exactly large but my thumb easily found the power button even though it was more flush or recessed than the others. The volume buttons on this model had a nice white accent around them, helping to stand out. Over on the other side you’ll find the SIM card slot and microSD expansion card slot. Both are accessed by opening a hatch-like spot inside the same trim. I got the feeling the little rubber/plastic piece keeping it connected might break with repeated opening, however it’s not something you’ll be accessing a lot anyhow. Above and below the screen you’ll find stereo (not BoomSound) speakers; at the top left you’ll easily locate the camera. If you’ve ever taken a group shot with a front-facing shooter you know it’s not always easy to identify where the camera is. In some cases it’s pretty tough to discern which is a camera and which is an ambient light sensor. That’s not the case here; there’s nothing else to distract you. Flip the phone over and you’ll find the rear camera wrapped in the same blue accent, setting at the top left. Below the sensor is the LED flash. It’s worth noting that even with the pronounced appearance, the camera is flush and the entire rear of the device is flat. There’s none of that wonky stuff that comes with a lip or a camera that sticks out. 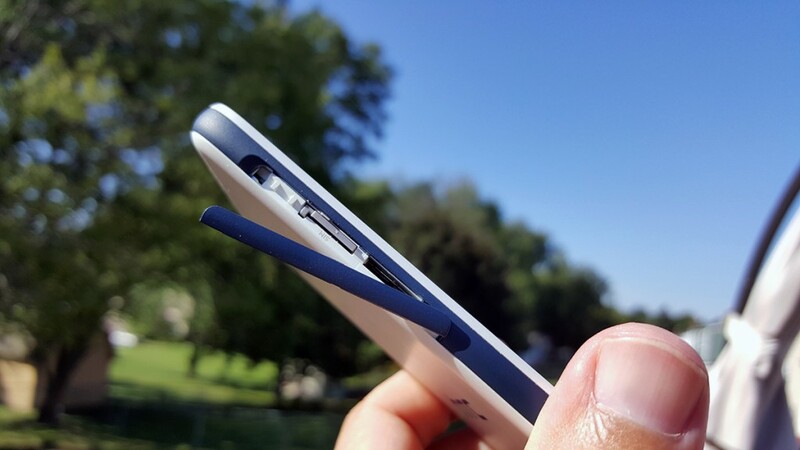 The battery cover does not come off of the Desire 626. HTC, or perhaps AT&T, placed a sticker on our review model advising not to try. This basically means no removable battery, which could be a pain point for some users. Wrapping things up, the headphone jack can be found at the top while the bottom offers up the microUSB port. Powered off, and a quick glance, it doesn’t appear that the Desire 626 has much of a bezel around the display. Look closer, or simply turn it on, and it tells a different story. Suffice it to say, this phone could feel even better in hand were HTC to pare things down a smidge. The LCD screen measures 5-inches however the resolution is only 720 pixels. While it’s still HD, it’s not the 1080 stuff and it doesn’t come close to the 1440 pixel screens found in top models. Does this matter to you? For the target audience, I suspect the resolution is not that big of a deal. 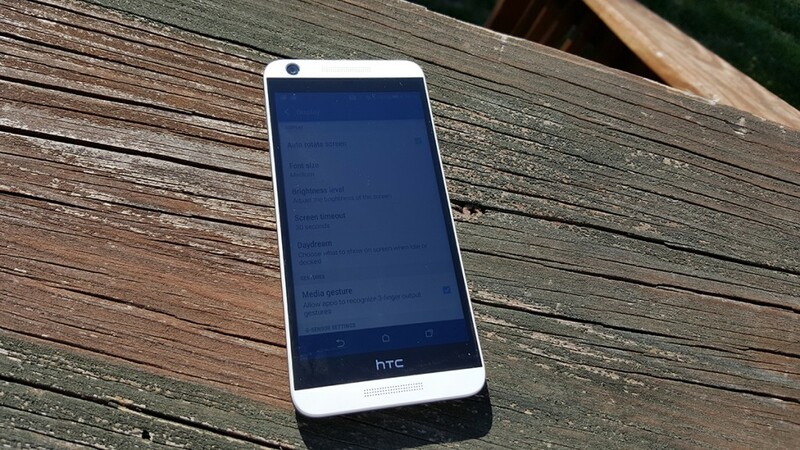 Even at full brightness, the Desire 626 is tough to see in direct sunlight. Color was accurate in our usage and matched up closely enough with other smartphones to satisfy us. It was only when we compared images to other phones that we found the Desire 626 lacking. We might have had to turn the brightness up to the full setting to see it outside, but all other conditions were impressive. If this is your first smartphone then you’ll no doubt be impressed with the screen. If you’ve spent considerable time with higher resolution phones you’ll feel the difference in no time. We didn’t have any issues with basic phone calls; our callers could hear us and we could discern the other end. There was nothing here to suggest HTC cut corners or used a generic speaker for calls. Although there are two speakers on the front of the HTC Desire 626 only one of them is employed for speakerphone. In the cases where you put a call on speaker you’ll use the bottom. It’s loud enough for office, cars, and general house usage. Get into a situation where it’s a little louder and you may just want to switch over to the earpiece. It worked in noisy conditions, just not overwhelmingly. Interestingly, the same bottom speaker plays music from it but it’s not a stereo sound. Get it up too loud and it really shows its limitations. The top speaker sounds just fine in most scenarios we tested and had decent quality even at the higher levels. 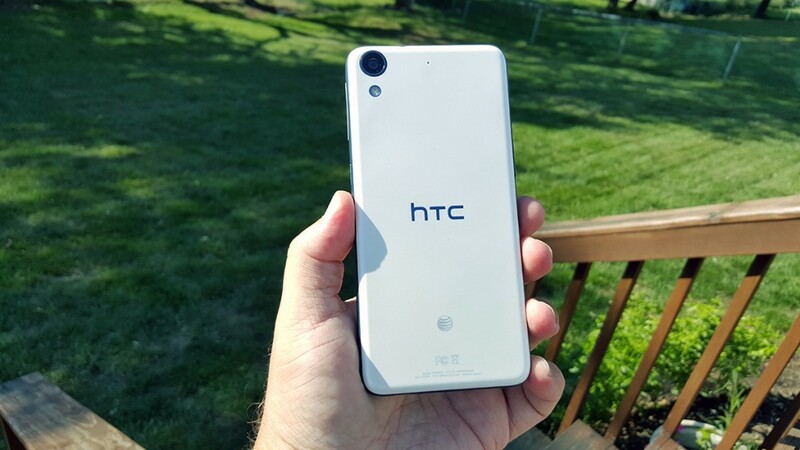 The HTC Desire 626’s rear (8-megapixel) camera performed as expected, meaning it didn’t exactly wow us. Pictures were fine for most of what we needed but we certainly wouldn’t say the camera is a leading feature. If your main concern is the occasional selfie, group shot, or still life, you will be pleased. Do note that you’ll want good lighting as the indoor, evening stuff we took often had grain or noise. Right out of the box, the camera app is easy to work with and gets you directly into snapping pictures. There are three modes to choose from: selfie, normal, and panorama. You can hope between these in the settings screen or you can also jump between them with a simple swipe of the screen when the camera is running. Those who prefer to take things into their own hands will be happy to know there are also settings for exposure, ISO, and white balance Additionally, you can also adjust things for different scenarios or settings with portrait, landscape, macro, night, HDR, and even make-up levels for selfies. Also present are settings for contrast, saturation, video quality, timers, and more. Unlike the HTC One M9, however, you cannot download anything else to the camera for extra customization. Selfies aren’t my thing, but I found the 5-megapixel shooter to be plenty decent in most settings. It tends to show a little more noise, but that’s generally the case with most front-facing sensors. Video recording can be done at 720 pixels which is considered high definition. No, it’s not 1080 or even the 4K stuff, but the target demographic likely doesn’t mind. Good in a pinch, it’s gonna get the job done for Vine, Instagram, and Snapchat. As for extended recording of little league football, not so much. With a 2,000mAh battery, the Desire 626 may need a boost or two throughout your work day. I tend to play a little harder on my phones, especially when setting them up with a suite of apps and settings. With that said, I was reaching for a charger by dinner time. After a few days, and when things slowed down, I was able to eek out another 1-2 hours of usage. Even when compared to other entry-level phones this one doesn’t quite stack up. Even the Moto G, at $180, comes with a 2470mAh battery. But, keeping in mind the average Desire 626 customer, it will be enough to power their entire day. No removable back or removable battery here. To help, HTC includes Power Saver and Extreme Power Saver modes. The former turns off some of the lesser seen and used features in the phone to extend the life a few hours. The latter ramps this up and toggles off a lot of functions in the name of life. If you’re down to the last few percentages of battery and need to use your phone in an emergency, switch to this and knock off the stuff that isn’t related to basic calling. The HTC Desire 626 runs Android 5.1 Lollipop atop the most recent HTC Sense user enhancements. This means that users can expect to have personalization and customization. Want new icons, fonts, wallpapers, or (even) keyboards? HTC makes it easy to do so. There are plenty of options to play with on the Desire 626, be it the home screen, lock screen, or something else. It doesn’t take long for users to set the phone up to something that feels unique and distinctly yours. HTC Sense does a great job of holding a user’s hand without making them feel stupid in the process. It’s definitely not as lean as other custom UI’s but it has come a long way over the last few years. As part of its customization, HTC loads an app called BlinkFeed on its smartphones. Designed to provide users social media and news in a quick and easily digestible manner, it’s found on the left home screen of the phone. You can remove it if you’d like, or prefer other apps and services for the same duties. If you’re new to smartphones, though, you might like this. You can personalize the lock screen and its behaviors with icon shortcuts to apps; users can opt for PIN, passwords, patterns, and other security measures. For those who tend to open their phone just to check email, Facebook, or take a picture, these shortcuts can be invaluable and save seconds. It could be all the difference in a photo of your friend in action. Other HTC apps include Zoe and the One Gallery. Working together, these can help you create images and videos for events, places, and times that are far more interesting than a single photo. They’re fun to play with and sharing your creations is quite easy. I cannot speak for other carriers but there are a ton of apps pre-installed from AT&T. You’ll find all sorts of things here that work with their services or tie into their accounts. You can’t remove them or hide them by default but a third party app like Nova Launcher can help tuck them out of sight. You won’t be able to run too many concurrent applications on the phone and playing some of the newer first person games is just about out of the question. But, for social media, pictures, email, and other basic necessities, it’s sufficient. Priced about $200, the HTC Desire 626 is about 1/2 or 1/3 the cost of today’s major smartphones. Considering this, we should not expect anything along the lines of a flagship experience. 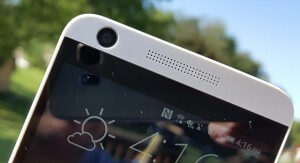 The HTC Desire 626 comes in right where we would expect for something in this space. Specifically, it does not underwhelm but it never overwhelms, either. When you look at other phones in this price point, such as the http://www.androidguys.com/motorola-moto-g-2015/ you tend to get more hardware for the money. And, given the added customization that you find with a Moto G, the phone feels more unique and yours. Let’s not forget that Desire 626 will be carrier locked, if only at first, should you get it from a wireless provider. This might not matter to a lot of you, but it could be a big deal if you plan to travel outside of the country soon or are the verge of breaking up with your carrier. If the review sounds like I am wishy-washy it’s likely because I just didn’t find anything that had me overly impressed. There’s nothing wrong with the phone by any stretch, it’s just kinda boring and average. Ironically, I kinda wish HTC might continue along this trajectory for some of its future devices as it physically feels fresher than the One M9 at this point.